Although this post sounds more appropriate for the month of October, I could not wait that long to write about it. This wine proves that I still have a loooong way to go on learning more about wine and the foods to pair it with. Normally, I like a big, bold, classic Napa red like a Cabernet, but this wine was much more subtle, refined and, at times, a tad sophisticated for my inexperienced palette. Should this intimidate any wine drinkers? Hell no! I say drink on and keep learning. So back to the wine. This was a 2012 Cabernet Franc that we enjoyed over the weekend with a good friend and his trusty canine friend Mr. Jensen. The color is deep and beautiful and the taste was smooth and very easy to drink. We planned to enjoy it with fresh steak filets, but the bottle was gone long before we even fired up the grill. There is a great story behind the winemaker and I may have to save that for another post because we would like to visit her vineyard at some point in the not-too-distant future. 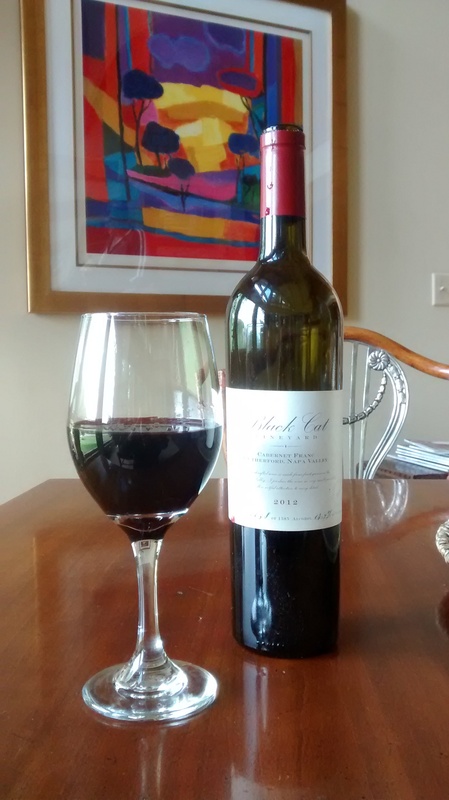 This wine can be purchased if you are a member of The Black Cat Wine Club, but there are others on the Black Cat website that range between $55 -$75. Thank you to Hobie for a fun and relaxing weekend. We enjoyed the wine, great company and laughs. 😉 Also, a big thank you for the generous Christmas gift which was a lovely bottle of 2012 Syrah and gorgeous corkscrew from this vineyard. Always tasting and learning and evolving. Sounds delicious!